Do not let your heart be troubled. Believe in God, believe in me too. In the House of my Father there are many abodes. If not, I would have told you, for I am going to prepare a place for you. And when I go and prepare a place for you, I will come again and will receive you to myself, so that wherever I am you may be also. Yeshua starts saying - with emphasis - that in addition to faith in God, faith in him is also necessary. There is no reason for his disciples to be alarmed. Apparently, Yeshua had noticed that reaction after he had said that he would go away; that they would seek him, but would not find him. Why would they not be able to find him? Because he went to a place where - for the time being - they could not follow him (John 13:33-37). Why not? He had to go first to prepare a place for his followers in the House of his Father, so that - on his return - they could take up residence there. This was therefore no cause for concern for them. On the contrary. Just as they had relied on God and on his Word in the past and had found consolation therein, they were now also to rely on the words of truth of their Mashiach and find enlightenment. In verse two Yeshua said in effect: "If you would have had some wrong ideas - that something is true while it is not true - then I would certainly have made you aware of it. You must know that in the House of my Father there are many abodes (or >> dwellings)". For them that was quite a new truth! In their sacred Scriptures, they had not yet met that idea. 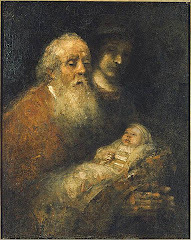 However, what did Yeshua mean by that expression: The House of my Father? Where does the Father actually live? Many will answer immediately: God lives in Heaven anyway! Thus speaks YHWH: The heavens are my throne and the earth is my footstool; what kind of House would you want to build for me, and which Sanctuary would be my resting place? From this Scripture, we may evidently deduce that the entire universe includes God's dwelling place. And in that endless space - Yeshua assures us - many abodes are available. The Greek monè, plural monai, simply means a place to stay. In the NT that word appears only here and also in verse 23, where we read: Yeshua answered him: If someone loves me, he will keep my word and my Father will love him and we will come to him and make an abode with him. From Is 66:1, however, we still can conclude something else. 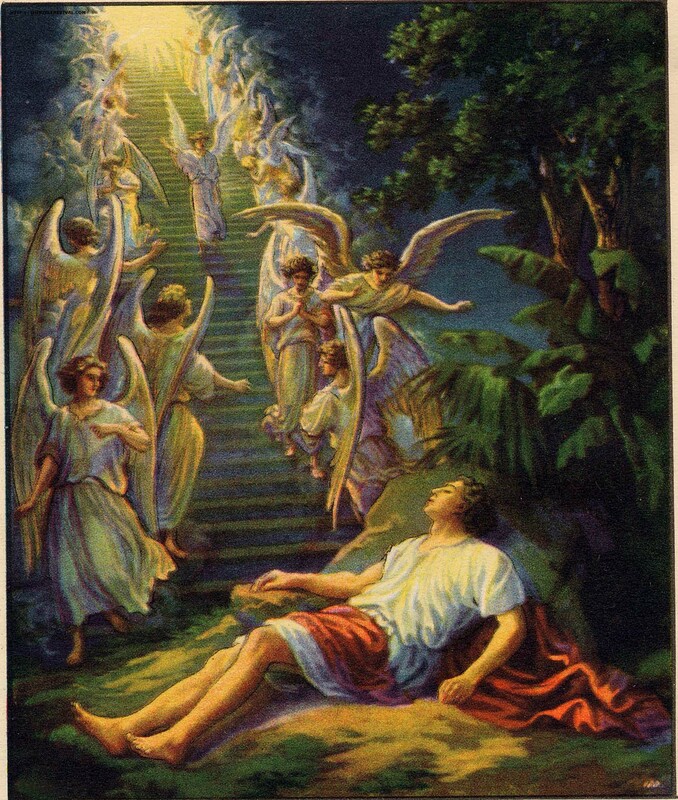 When God connects heaven and earth as being respectively his throne and footstool, he is referring to a House or Temple: Heaven is my throne and the earth is my footstool; what kind of House would you want to build for me, and which Sanctuary would be my resting place? In that Scripture YHWH Elohim, through his prophet, is speaking to the Jewish people of the End times. Those of them who then still reject Yeshua as their Mashiach, obviously will - with the support of their own chosen Mashiach, in reality the Antichrist - erect the Third Temple. Their deepest desire is namely to revive the old sacrificial cult, fully in accordance with the old Mosaic Law. However, YHWH Elohim does not need a physical temple building from those rebellious ones among his people! Compare: Da 9:27; Is 66:1-6 and 2 Thess 2:4. I am YHWH, the Elohim of your father Abraham and the Elohim of Isaac. The land on which you are lying will be given to you and to your seed.Your seed will be like the dust of the earth; you will expand to the west and the east, to the north and the south. And in you and in your seed [Israel to the flesh] all families of the earth will be blessed (Gen 28:13-14). And I saw a new heaven and a new earth, for the first heaven and the first earth passed away, and the sea is no more. And the holy City, New Jerusalem, I saw coming down out of heaven from God, prepared as a bride adorned for her husband. And I heard a loud voice from the throne, saying, "Look! The Tent of God with men, and he will store his tent with them, and they will be his people, and God himself will be with them.And he will wipe out every tear from their eyes, and Death will be no more, neither will mourning nor cry nor pain be anymore; the first things went away” ... And I did not see a temple sanctuary in her, for the Lord God Almighty is her temple sanctuary, and the Lamb (Rev 21:1-4, 22). With John we here see in visions the events that will mark the beginning of the Millennium. The old arrangement, whereby the demons behind the scenes of invisibility ruled over the corrupt society on earth, is out of sight. Completely disappeared. The Messianic kingdom is still the only power, visibly represented on earth by the people of the saints of the Supreme Being (Da 2:44-45; 7:14, 27). 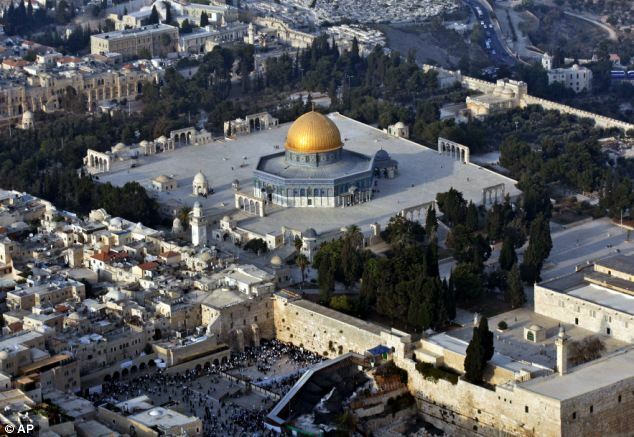 The visionary image corresponds to the former situation, as it existed in Israel: The one city of Jerusalem, or the one Zion, that formed the centre of the nation. There, since king David, was the seat of the (typological) Mashiach Empire, and there too the central place of worship was established: The (also typological) glorious temple, built by David's son Solomon. In Revelation, we see all that in antitype: The one Temple City of New Jerusalem, the seat of the Millennium Empire of the Mashiach. And that conclusion helps us considerably to discern what Yeshua meant by the House of my Father. It refers to a spiritual House consisting of believers in Mashiach Yeshua who - functioning from the Temple City New Jerusalem - will become a blessing for the Gentile peoples; entirely according to God's promise to Abraham in Genesis: In your seed all the Goyim of the earth will be blessed, because you have obeyed my voice (Gen 22:18). That conclusion is also consistent with Yeshua's own statement in John 2. When he cleansed the temple of unholy commerce, he said to the merchants: Do no longer make the House of my Father to a house of merchandise. And that is precisely the meaning of John 14:2, however, than in antitype >> In the House of my Father - the Temple City New Jerusalem - there are many abodes. In that text, Yeshua spoke in a form of the Greek verb eisin in the present tense. Even then, Yeshua could speak that way: With his coming and acting on earth, the new antitypical temple arrangement already had begun to take shape, although the Christian Church, his Congregational Body, would only come to existence on the day of Pentecost in 33 AD. That fact is evident from what he said to the Jews who called him to account for the cleansing of the temple: Break down this temple and in three days I will raise it up ... But he spoke about the temple of his body (John 2:18-22). 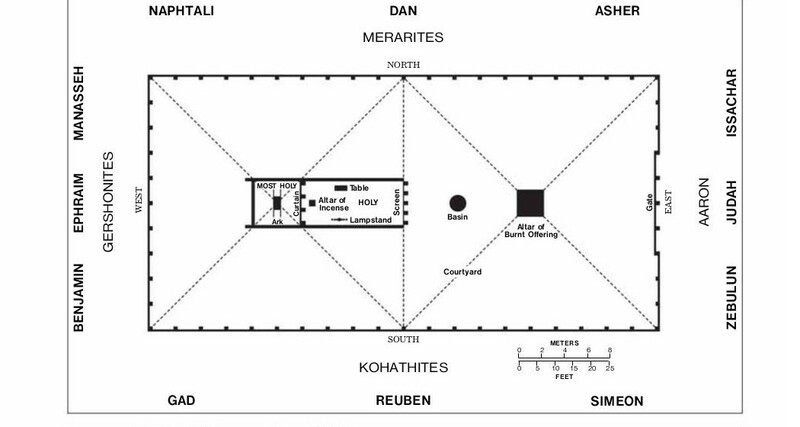 At Yeshua’s baptism, that antitypical temple arrangement already began to take shape. Through his immersion in the Jordan, he indicated that he identified himself with sinful humanity and that he was willing to die vicariously for her by sacrificing his life on the altar of God's will. 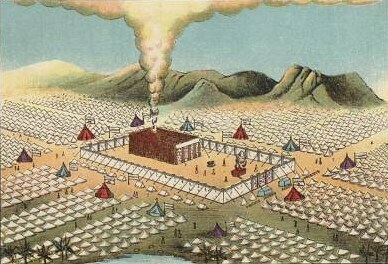 With the antitypical altar and the antitypical Courtyard, the antitypical Tent itself came into existence, in which the new High priest could perform his public service. Of course, his Father Elohim, the Supreme, always had his residence in heaven. However, when He "stored up" the true Tent, he could fit up that this exclusive dwelling took on a different aspect, or new characteristics. The holiness of his heavenly home was increased, in sharp opposition to the extraordinary sinfulness of humankind. His personal home now became the holy place where a righteous, but also merciful God was willing to accept an appropriate, perfect sacrifice for the benefit of unholy humankind. Of course, the value of such a holy and perfect sacrifice had likewise to be presented by a sinless, holy High Priest who had personal access to God. In that way, Elohim's heavenly throne became a throne of reconciliation. His heavenly dwelling took on the characteristics of an antitypical Most Holy. But what can be said about the Holy? That first, front section also has antitypical significance, again in the sense of a situation. As we already ascertained, from the time of his baptism Yeshua fulfilled his earthly ministry in the antitypical Courtyard as a perfectly righteous man, overseeing the dedication of his own soul as a perfectly sin-sacrifice. He was in the midst of his own (Jewish) people that he tried to serve and by whom he could of course be seen, just as was the case with the Courtyard of the Tabernacle. Although the members of the 12 non-priestly tribes did not have access to that Courtyard, they could observe everything that was going on there. With the Holy, however, it was different. That first section of the actual Tent had a shielding, a curtain, which hid from the eye everything that took place within it. Only Aaron and his priestly sons were allowed to enter into it for the daily and weekly cultic activities. When Yeshua was anointed at the time of his baptism, he was also begotten by God as his spiritual Son who, from that moment on, was on his way back to heaven. In that capacity he abided in the antitypical Holy; concerning his relationship to God shielded. His Jewish fellow countrymen could not perceive that spiritual condition with their literal eyesight. (1) The larger and more perfect Tent, not made with hands, therefore has nothing to do with a physical building (Heb 9:11-12). It is a spiritual 'building' that is built up with 'living stones', namely living persons, either in the possession of a spiritual nature (the heavenly Congregation) or of a human nature (the earthly Congregation). Compare One Peter 2:4-5. And to the first of those "living stones," on the eve of his death, Yeshua said: In the house of my Father there are many abodes ... I am going to prepare a place for you. Compare also Ephesians 2:20-22. (2) So, when Yeshua poured out holy spirit upon his waiting disciples on the Day of Pentecost of 33 AD, it provided proof that he had entered the antitypical Most Holy and to his Father had presented the value of his blood, thereby having gained an eternal redemption. After this excursion we return to John 14:2. Based on Isaiah 66:1 we concluded that apparently the entire universe can be considered as the House of my Father. The heaven, God's residence, has no spatial limitations. With the use of that expression, the Bible simply indicates that it is a dwelling place on a spiritual level. A very different level of life, therefore, than we humans experience here on earth. For that reason, the Scripture 1 Thess 4:15-17 does not present any problem. 16 for the Lord himself will descend from heaven with a commanding call, with the voice of archangel and with God's trumpet, and those who are dead in Mashiach will rise first. 17 After that we, the living, who survive, will together with them be snatched away in clouds, to meet the Lord in the air. And thus we will always be with the Lord. In the verses 16 and 17, the apostle describes the change to heavenly life of all members of Yeshua’s Congregational Body, all Christians who were included - by rebirth - in the Body of Messiah from Pentecost till that time (1Cor 12:12-13). Other persons - also the other believers - such as Abraham, Isaac and Jacob and all other pre-christian faithful will not share in the experience (event) that Paul describes here, in 1 Thess 4, and which he, later and more detailed, would elaborate in 1Cor 15: 51-52. See also: The Last Trumpet. Therefore, it is simply not true that all believers of all times will attain heavenly, immortal life. For example, it is easily demonstrable that Abraham did not expect life in heaven. He indeed expected a better patris, which belonged to heaven. Because he looked forward at the City that has [true] foundations, of which City we now know that it will be New Jerusalem that will descend from heaven, towards earth. In fact, an arrangement by which Elohim will then reside with all the people on earth. Because of that progress in God's purpose, it is said of those people then on earth: And death will be no more. For them, permanent life on earth is therefore possible from that time on. So, instead of going to heaven, YHWH Elohim will direct his attention on our globe the earth. Why? Because all the people outside Yeshua’sCongregational Body will in the future reside on earth. That Abraham was thinking exclusively of future earthly life, is also evident from the fact that he was willing to sacrifice his son Isaac. When he tried to bring that sacrifice, he did so in the belief that God could raise his only son if necessary. In heaven? Absolutely not! Abraham was expecting his son back in an earthly resurrection; for only then could the promise In Isaac your seed will be mentioned have progress! But back to 1 Thess 4. When Yeshua’s Congregational Body, his Bride, is snatched away, she goes to meet her Lord in the air. That Vine himself also believed that in this sense the phrase meeting the Lord in the air should be conceived, is apparent from what he wrote further about the Christians being resurrected: “They will be raised by his quickening voice, and will be caught away to meet him in the air, and, in due course, will return with him to the earth from whence they set out”. That in this course of events also the last generation of Christians will be involved - those who will remain alive until the parousia (presence) of the Lord Yeshua - Vine had indicated earlier. The dead are raised, but the bodies of the believers who have remained alive until then must be changed.And why? Because they can not enter their heavenly inheritance in their current, natural (human) state. However, as said before, Yeshua’s Body-members - after that meeting - will be forever with [the] Lord. And that is quite understandable. After all, their existence will be on the same level as that of the Mashiach, that is on a spiritual level. Having gone through the barrier of their flesh, just like Yeshua himself, they pass the curtain (or: veil) and are granted access to the holy place, the heavenly throne room of the Father. However, in what way are we to view the joint return to the earth? Clearly not as a geographical displacement, but rather in the sense of focusing attention on, as is also applicable in Rev 21:2-4 (see above). When the heavenly Congregation of the New Jerusalem descends from God in heaven, all her attention will then be focused on the situation that will then exist on earth among men. And those people will indeed experience that attention. They start noticing that completely new conditions are emerging among them. Nothing remains in the same, old conditions. As scripture is telling us: All things are being made new! When the Mashiach, your life, is made manifest, you will also be made manifest in glory together with him (Col 3:4). However, it always remains true that they find themselves all the time in the monai of the Father's House, in the abodes that their Lord had prepared for them, and also in the sense of a close relationship with both the Father and the Son, on a spiritual level. Look, I tell you a mystery. We shall not all be laid to sleep, but we shall all be changed, in an indivisible moment, in a blink of the eye, in the last trumpet. For the trumpet shall sound, and the dead shall be raised incorruptible, and we shall be changed. For this corruptible must put on incorruption, and this mortal must put on immortality. But as soon as this corruptible puts on incorruption, and this mortal puts on immortality, the word will become reality, that is written: Death is swallowed up in victory (1Cor 15:51-54). The One who alone possesses immortality, inhabiting an inaccessible light; whom no man has seen nor can see. To him be honour and eternal power! Amen. For our citizenship exists in the heavens, from which we also eagerly await a Saviour, Lord Yeshua Mashiach, who will refashion the body of our lowliness to be conformed to the body of his glory. Paul himself could not imagine anything greater than to take up residence with the Lord, as he had earlier formulated in the Second Corinthian letter: We know that when our earthly tent dwelling is dissolved, we will have a building from God, a non-handmade, eternal dwelling in the heavens. For him, Paul, the resurrection body is like a building, an eternal house in the heavens. The apostle is constantly talking about us, plural. Thus, he assured that the heavenly destination, taking up residence with the Lord, applies to all real, chosen and called Christians (Rom 8:28-30). And now, you glorify me, Father, beside yourself with the glory which I had beside you before the world was ... Father, what you have given me - I want where I am, they too be with me, that they may behold my glory which you gave me, for you loved me before the founding of the world. From Pentecost 33 AD, with the foundation of Yeshua’s Body of believers, completely new perspectives were created for Jews and Gentiles alike who were called by God in connection with his purpose in Mashiach Yeshua (Rom 8:28-30). A new aeon (age, world period) then had its start within Elohim's purpose, by creating the heavenly part of the seed of Abraham. That part of the Seed has come to be known as the Bride, the Lamb's Wife, who, as the heavenly part of the New Jerusalem, will eventually descend from heaven to become a blessing to the Gentile nations living in the Millennium on Earth. This implies that all others who will be favoured with (eternal) life by YHWH Elohim, will have their destiny on earth. Among them are the believing Jews (and their forefathers) from before and after the aeon in which the Body of Christians is called. And as soon as the thousand years have come to an end, Satan will be released from his dungeon, and he will go out to deceive the Gentile peoples that are at the four corners of the earth, Gog and Magog , to gather them to war. Their number as the sand of the sea. And they [a considerable portion of the Gentiles that went through the judgment of the Millennium] advanced over the breadth of the earth and encircled the camp of the saints and the beloved City. However, fire came down from heaven and devoured them (Rev 20:7-9). At whom will those rebellious nations aim in that for them decisive phase? Answer: At the camp of the saints and the beloved City. Here it becomes clear that the beloved City, the New Jerusalem, was represented on earth by the saints for 1000 years. No, not the saints of the Christian Congregation, but the saints or elect of the Jewish Congregation. See for additional details regarding their destination: Dan 7:17-18, 27; Isa 65: 9, 15. In this connection, something else has to be remarked: For what purpose is Satan bound for 1,000 years? In verse 3 of Revelation 20 that question is answered: Lest he deceive the Gentile people any longer until the thousand years are finished. So, the new society on earth, from its beginning, therefore includes - in addition to the Jewish saints - especially the nations, the Gentiles [Goyim]. And that, of course, does not surprise us at all! Because, from Mt 25:37, 46 we already knew in advance that it will be the 'sheep' - the righteous among the Goyim - who will be the first to make the crossing from the old aeon to the new aeon, the Millennium. However, for sure in the company of the Jewish saints! Concerning the 'sheep' it is prophetically clear that they - for their salvation - will distinguish that there is a necessity to join those believing Jewish saints, who in that period will suffer much tribulation. They [the ‘sheep’] will grasp the slip of a man who is a Jew, saying to them: We want to go with you, for we have heard that God is with you.